Neuschwanstein Castle is now a wildly popular tourist destination near Munich, welcoming 1.4 million people per year with approximately 6,000 per day visiting in the summer. It’s vital to plan ahead if this castle is on your list. Due to the need to arrive for your tour at a designated time, you need to purchase or pick up your tickets first, then determine how best to spend the rest of your day. Do you need to head straight up to the castle or do you have a couple hours to kill and want to visit the village before your Neuschwanstein Castle tour? We loved the architectural details of the village and would have enjoyed spending many more hours than we did, wandering the streets. Unfortunately, photos are not allowed in the castle. The opulently decorated rooms are stunning with vibrant colors and gorgeous detail. Even the kids were awed by the rooms. Hohenschwangau Castle, the nearby childhood home of Ludwig II, was more “lived in” than the neighboring Neuschwanstein castle. Therefore, many people prefer the inside of Hohenschwangau. Since I didn’t get a chance to go into both, I can’t give a personal opinion. If you have a day, plan to visit both. After exploring the castle, we walked to Mary´s Bridge (Marinebrücke). The bridge was unbelievably crowded with people pushing and shoving to get by. Hold tightly onto to your kids hands to ensure you don’t get separated. Most people stopped at the first part of the bridge to take pictures, then turned around. Make your way to the opposite end to get a bit more breathing room. You could also cross the bridge for more views and a hiking trail. Neuschwanstein Castle is located near Schwangau and Füssen in Bavaria. You can arrive by car, train or tour bus. By Car: Take the A7 motorway in the direction Ulm-Kempten-Füssen until it ends. From Füssen first follow the road B17 to Schwangau, then the signs to Hohenschwangau. You can also take the A7 motorway getting off at exit Kempten. Then the road B12 to Marktoberdorf. Follow the road B16 to Roßhaupten – OAL I to Buching – then take B17 to Schwangau and Hohenschwangau. *The village of Hohenschwangau has only private parking facilities. By Train: Take the train to Füssen, then the bus to Neuschwanstein – stop “Hohenschwangau Neuschwanstein Castles, Schwangau”. By Tour Bus: There are several tour companies available, providing transportation to Neuschwanstein Castle from Munich. We booked with Viator during our visit. While we learned a lot of history during the journey and didn’t have to wait in line for tickets, I felt we missed out on too much as we didn’t get to visit Hohenschwangau Castle, which was not included in the tour. We were also rushed the entire visit, so it ended up being more stressful than I had anticipated. My suggestion would be to arrive via car or train. A tour is an option, especially if you have limited time and only want to see Neuschwanstein Castle and a little bit of the village. Tickets can only be purchased at the Ticketcenter Hohenschwangau in the village of Hohenschwangau below the castle but can be reserved online for a particular time and for a small fee. Reservations are suggested during peak season as times can sell out. However, the wait time to purchase tickets in line without a reservation can be up to an hour. Then you may have hours until the next English speaking tour – that’s assuming you get the ticket. If you’re not sure of your schedule, you can go this route – most advisably only in the off season. Even if you reserve tickets online, you’ll still need to pick them up at the “reserved tickets” counter in the Ticket Center Hohenschwangau. Do this at least one hour before your confirmed entrance time. You must factor in wait time for ticket collection as well. Arrive early! This is extremely important! Your entrance ticket is valid at a set time for a guided tour of the castle ONLY. If you miss your time, you don’t get in or get a refund! There are large screens where upcoming tour numbers are displayed near the entrance, so you know when you are allowed to get in line. Don’t try to get in early and don’t be late! Your entrance time and tour number will be printed on your ticket. It takes 30-40 minutes to walk from the ticket center to the castle. The walk is 1.5km (just under a mile) up a steep uphill road. You can also go by horse-drawn carriage or shuttle bus. We walked up the hill and didn’t find it too daunting, even with the kids. We took a couple of breaks during the walk and we stopped for pictures. *Tickets can be purchased from the carriage driver. *Tickets can be purchased on the bus. Rucksacks, strollers, child carriers and large items can’t be taken into the castle. We had a small backpack and had to wear it in front. 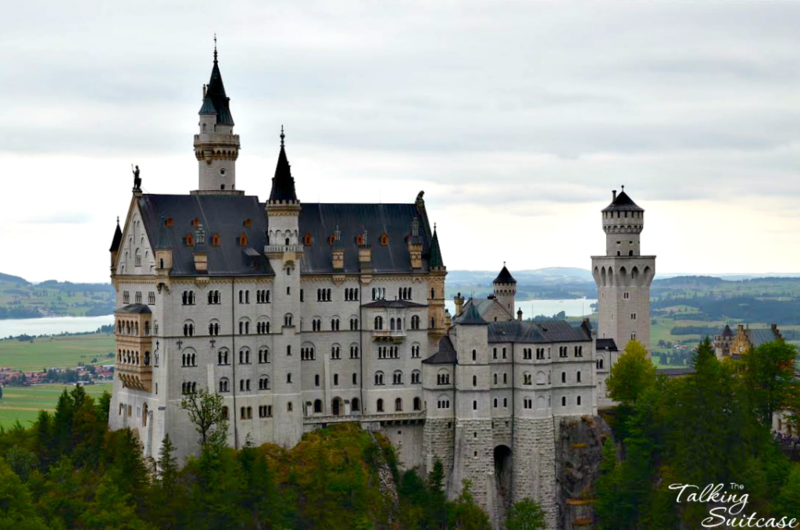 The tour time to visit the 14 completed rooms of Neuschwanstein Castle is approximately 30 minutes. King Ludwig II died before the castle was completed, and the castle was opened to visitors just seven weeks after his death. Get kids excited about the visit with puzzles, a memory game and royal crown kit on the website. Guided tours are available in German and English. Audio guides are available in other languages. Restaurants and quick service meals are available. One cafe is in the castle, others are outside and in the village. Packing a lunch is also a great option. You can’t beat the view! Linderhof is less than an hour away from Neuschwanstein. Consider visiting here during your trip as well. You don’t need a ticket to wander the grounds, just for the guided tours to see inside the castle(s). While I highly suggest the tour, you can just pop by to see the village and view castles from the outside. If you don’t get a ticket, it’s okay. Just relax and wander. The castle is open year round with views changing along with the season. We visited during the peak summer season, but would highly recommend fall or spring. Winter to see the castle covered in snow would also be amazing, but I don’t foresee my kids wanting to spend too much time outdoors. I always have difficulty finding gifts for my kids now that they are getting older. Well, gifts that aren’t electronic, that is! I recently purchased the Ravensburger Neuschwanstein 3D Puzzle for K to serve as a daily reminder of our lovely visit. I think this could also be a fun way to introduce kids to the castle. Possibly part of a “we’re going to Germany” surprise. My eventual plan is to purchase more of these sets of other landmarks we have visited and for places we plan to visit in the future. If you’re looking for more information on Neuschwanstein Castle, there is a highly rated book entitled, Neuschwanstein Castle: An Exploring Castles Travel Guide,which can help with more detailed planning and travel insights. I prefer the ebook, but there is something to be said for having the book in your hand during your trip. Whatever name you prefer- Mad King Ludwig, the fairytale king or the Swan King, King Ludwig II of Bavaria designed an impressive castle. Spend half the day exploring the fairytale castle of Neuschwanstein, making sure to save time to see Hohenschwangau Castle, the village and to take photos from the bridge. What are your tips for visiting Neuschwanstein Castle? I visited Neuschwanstein years ago, but only for a few hours as it was a slight detour from the road trip we were on. I only got to stand on the bridge, so I’ve always wanted to go back. I didn’t realize that I didn’t need a ticket to wander the grounds though, that’s good to know! Great tips, I’m sure they will come in handy once I finally get there! How funny you had this castle on a puzzle when you were young! My son is looking forward to putting his 3D puzzle together. Neuschwanstein castle is very beautiful and I have heard a lot about it. I was in Germany last year but unfortunately could not visit it. Really missed it. It’s a beautiful castle! If you return you should add it to your list. Next time you’re in Germany for sure! I also read a few places that it inspired Sleeping Beauty’s castle as well. It really does look like it came straight from the pages of a fairytale. It’s not surprising it’s so popular, what a great opportunity to teach the kids some real history while they are mesmerized by the familiarity of it all. Neuschwanstein really is a picturesque and famous castle. I’ve been meaning to visit for a while but still haven’t made it there. Your tips are very useful and I’ll try to take advantage of those once I finally visit! Early call for photos with no one around. Yep, arrive early to get photographs with no one around. I’d love to see it at sunrise or sunset but I’m not sure if you can get on the bridge that early/late or not. what a gorgeous castle. I knew there was a German castle used as the inspiration for Cinderella’s castle, but I didn’t know it was Neuschwanstein Castle. Really helpful hints and tips too for visiting. With 1.6 million visitors, those tips could certainly come in handy for navigating the crowds! Glad you found the tips useful Drew. I was floored when I researched the number of visitors that pass through the castle each year. Stunning fairytale photography. Transports you right there, and in to an instant princess!!! Thanks Sara! You do feel like a princess wandering through those rooms. I went to this castle many years ago with my father and it was nowhere near as busy as what you describe. It has obviously become very popular since but I would love to return as we never went inside and I love fairytales, castles and mysteries. I would have loved to visit when it wasn’t busy. You should definitely return and see the inside.